Contract workers at the Wongawilli Colliery in the Southern Coalfields of New South Wales have ended their industrial action against site owner Wollongong Coal ahead of schedule. The Queensland Mines Inspectorate has launched a formal investigation into the dozer rollover at the Saraji coal mine on New Year’s Eve. 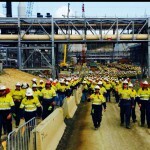 The Construction, Forestry, Maritime, Mining and Energy Union (CFMEU) has criticised an enterprise agreement by energy company New Hope Group at its West Moreton coal operations in Ipswich, Queensland. The Fair Work Commission (FWC) has approved the formation of a new union between the Construction, Forestry, Maritime, Mining and Energy Union (CFMEU), Textile Clothing & Footwear Union of Australia (TCFUA) and Maritime Union of Australia (MUA). A vote to join the Maritime Union of Australia (MUA) and Textile Clothing and Footwear Union of Australia (TCFUA) with the Construction Forestry Mining and Energy Union (CFMEU) — forming a massive, amalgamated trade union movement — has received overwhelming support. 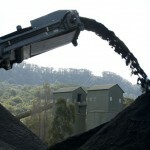 An industrial dispute over workplace agreements at Glencore’s Oaky North coal mine near Rockhampton in Queensland has now spanned six weeks. 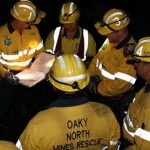 The Queensland department of natural resources and mines (DNRM) has granted the final heritage approval for Carbine Resources’ Mount Morgan gold copper project, southwest of Rockhampton. With the 20th confirmed case of black lung in Australia since reports that the disease resurfaced two years ago, the Queensland Government has been taking extra protection measures for mine workers, but is this enough? The number of mine workers diagnosed with black lung in Australia has risen, with the 20th case confirmed in Queensland. The CFMEU mining and energy division has called on new Queensland Resources Council CEO Ian Macfarlane to provide further financial support to victims of black lung. The CFMEU has welcomed the first day of public hearings for the Queensland parliamentary inquiry into black lung held in Brisbane today. 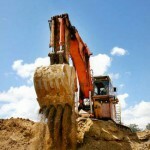 A 55-year-old Queensland man has been confirmed as Australia’s first case of black lung from an open cut coal mine. Up to 90 workers will be cut at Anglo American’s German Creek coal mine following a series of industrial actions and failed EBA negotiations. The CFMEU is supporting the Black Lung Victims Group’s call for a 10c a tonne industry funded compensation levy for victims of the disease. The CFMEU has alleged American Anglo is advertising for a new workforce to replace striking workers at its German Creek coal mine. 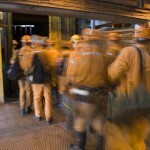 Anglo American German Creek coal miners are striking as Enterprise Bargaining Agreement negotiations fail to meet a conclusion. 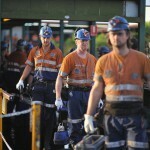 Rio Tinto’s Hail Creek coal mine has been fined $50,000 after illegally standing down an injured miner. 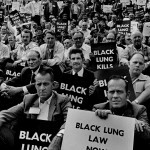 As Australia’s coal mining industry comes to terms with the resurgence of black lung the possibility of capping coal mine worker’s redundancy pay at nine years has again thrust the industry into the spotlight. Sharon Masige writes. A former miner has died due to complications from Black Lung, the CFMEU has claimed.